Google announced the launch of two new mobile commerce services that the company says will revolutionize the consumer shopping experience. Dubbed ‘Google Wallet’ and ‘Google Offers,’ the new Android apps will work together to enable customers to pay for goods, use their loyalty cards and redeem coupons all in a single tap at the point of sale, said Stephanie Tilenius, Google’s vice president of commerce at the launch event. The Wallet app stores multiple payment cards, including a new prepaid Google card that the customer can use to make contactless payments at the point of sale. Offers is a marketing program that lets users redeem digital coupons culled from the Net or nabbed from NFC posters. Google has partnered with Citi, Sprint, MasterCard and First Data to launch the service but the platform is open to anyone who wants to join, Tilenius said. Field trials are already underway in New York and San Francisco, with a broader launch set for this summer. Participants include Macy’s, Toys ‘R Us, Subway, American Eagle Outfitters, Walgreens, Noah’s Bagels and more. With merchants nationwide already integrating support for the service, NFC payments via Google Wallet are right around the corner for U.S. customers. But Google has a more complete shopping experience in mind that will take a little bit longer to come together, Tilenius said. 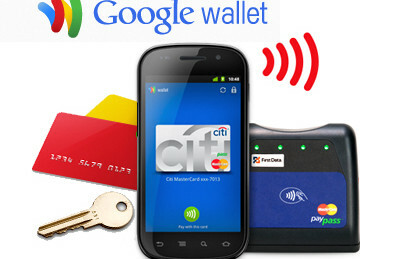 Upon entering a store, a user’s NFC Android phone will automatically determine the location and begin working with Google Wallet and Google Offers to tailor your shopping experience. A welcome screen will pop up along with a shopping list based on your previous buying habits. Google will track down any deals in the store than align with your shopping history. For example, when going into a grocery store your phone might remind you when your favorite kind of bread is on sale, or if there is a coupon available for your usual purchases like eggs or milk. When it’s time to check out, a customer simply taps the NFC-enabled phone against the reader and Google Wallet will automatically assemble everything you need to pay–including credit card, customer loyalty card and any coupons you’ve picked up. All three items are passed to the terminal in a single tap, and once the cashier OK’s the transaction all that’s left is a signature to confirm the purchase. In the near future, Google plans to let you store anything that you would keep in your normal wallet on your phone, including tickets, IDs, health insurance cards and more. The company also plans to add a feature that will allow customers to share receipts with merchants over the phone, eliminating the need for paper. Google is providing several layers of security for the new service. Google has chosen First Data as its Trusted Service Manager (TSM), whose job it is to communicate with the phone’s secure element during a transaction, said Rob Von Baron, a security engineer at Google. According to Von Baron, your encrypted card information is shared only with the bank and the TSM, and is provisioned securely en route between the two throughout the entire transaction process. In addition, Google’s Nexus S handset, available from Sprint, contains a secure element from NXP, the same kind found in passports and contactless credit cards. These chips store and encrypt all of the user’s financial data, which is kept separate from the Android phone’s memory, Von Baron said. The service also enables users to set a PIN to unlock the phone, and another to unlock the Mobile Wallet. Additionally, when the screen is turned off, the NFC antenna is automatically disabled, ensuring that no one can skim your data while your phone sits dormant in your pocket. At the news conference in New York, Google urged prospective partners to take advantage the open platform, which is free of charge to join. “The goal is to level the playing field,” said Osama Bedier, vice president of payments at Google, adding that the new service will let small merchants leverage the same kind of coupon and loyalty tools that major retailers enjoy, while large retailers will be able to use personalized offers to simulate the ‘one-on-one’ shopping experience that gives small retailers their edge.